After a week on the rock catching up with the team, we are excited to announce that Michael’s Genuine® Food & Drink in Camana Bay will welcome back The Genuine Hospitality Group Special Ops Chef Thomas Tennant from Miami for the return of a favorite event on-island! 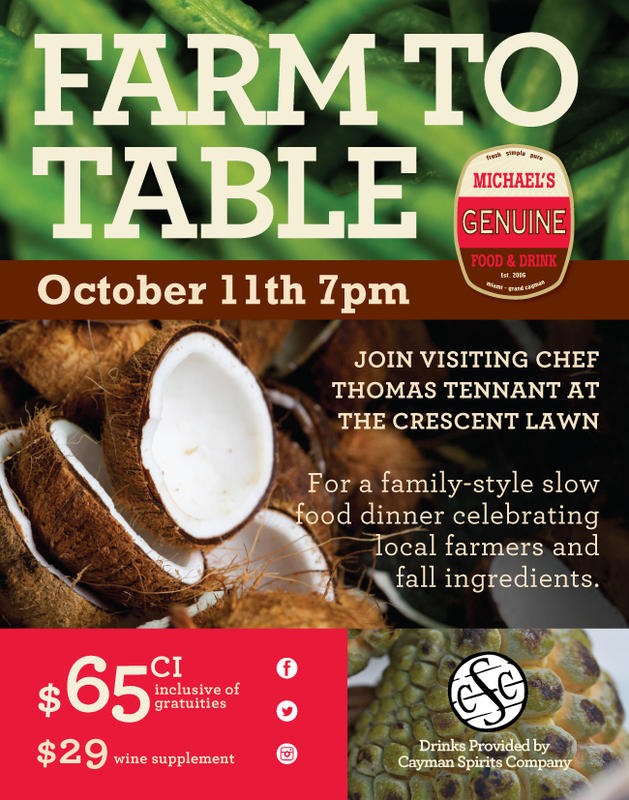 Its Farm-to-Table Dinner Series is back for the fall season on Saturday October 11 at 7 pm and celebrates local farmers and seasonal ingredients in a family-style menu of four courses for CI $65 (CI $60 for Slow Food members.) An optional wine supplement is available for an additional CI $29. The evening will begin with a welcome cocktail sponsored by Cayman Spirits Company on the Crescent Lawn, followed by a family-style dinner in the restaurant. Thomas is really into coconut and its health benefits these days so the menu definitely reflects this, from cocktails to dessert. A very special thanks to our farmers Hamlin Stephenson, Patrick Panton, Joel Walton and Clarence McLaughlin for their gorgeous product! Click here for menu and for reservations, please email camille@michaelsgenuine.com or call 345.640.6433. For a last taste of summer, visit our Flickr album of Camana Bay’s Wednesday Farmers Market.